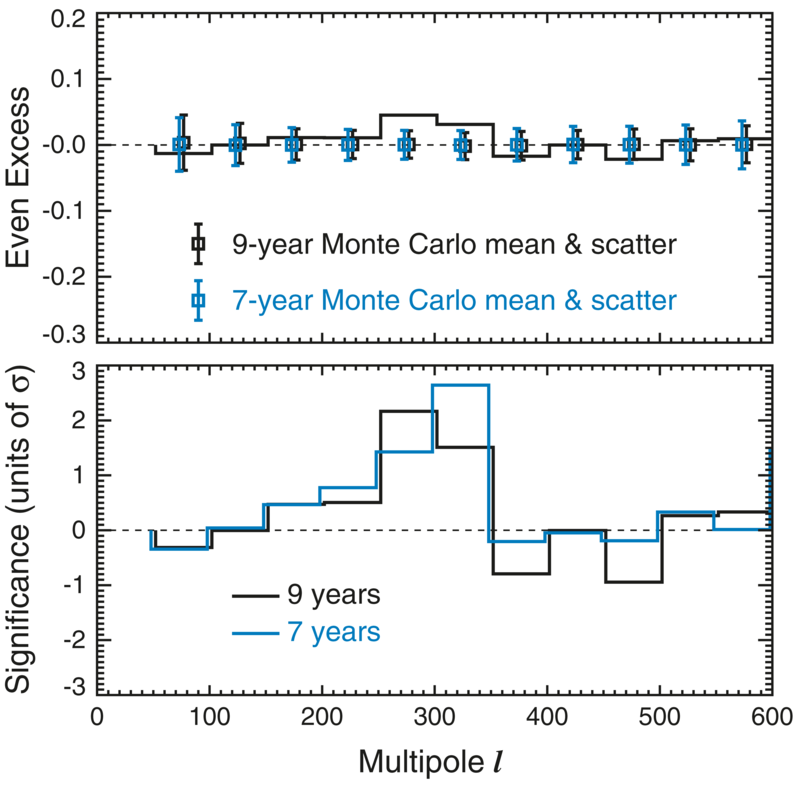 WMAP Nine-year Paper Figures, C. Bennett, et al. 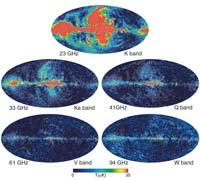 The estimated level of artifacts (ξ) that would have occurred in the Ka-band map if no processing mask had been used. Band-dependent processing masks were used and tailored to minimize these artifacts when converting from time-ordered to sky map data. 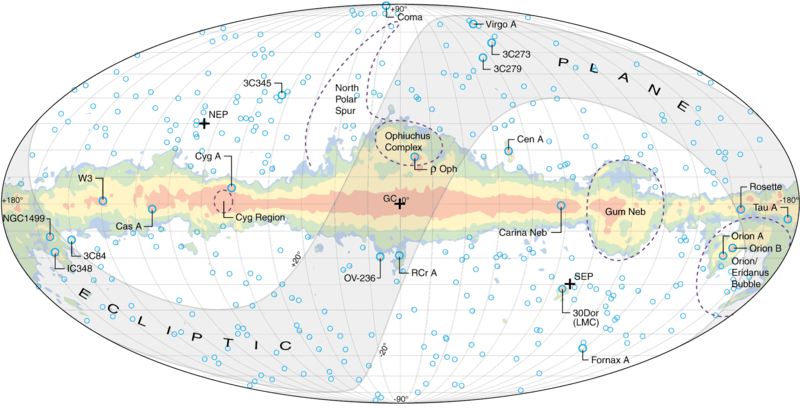 This map is in Galactic coordinates and the high intensity regions arise from observations when one of the beams is near the Galactic center and the processing mask is not used. (See Figure 17 to compare with the analysis sky cuts.) Since bright artifacts originate primarily from beam crossings of bright Galactic plane regions, the nature of the unmasked artifact pattern is similar for all DAs. Although the patterns are similar for all bands, the highest amplitude artifacts occur in K- and Ka- bands because these have the brightest foregrounds. 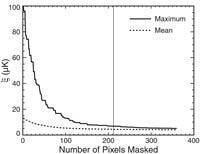 To prevent significant artifacts, processing masks are constructed for each band by growing the number of pixels in the mask until ξ is sufficiently reduced. The estimated mean residual level of artifacts (ξ) is given in Table 4. We required ξ < 5 μK for all but K-band. 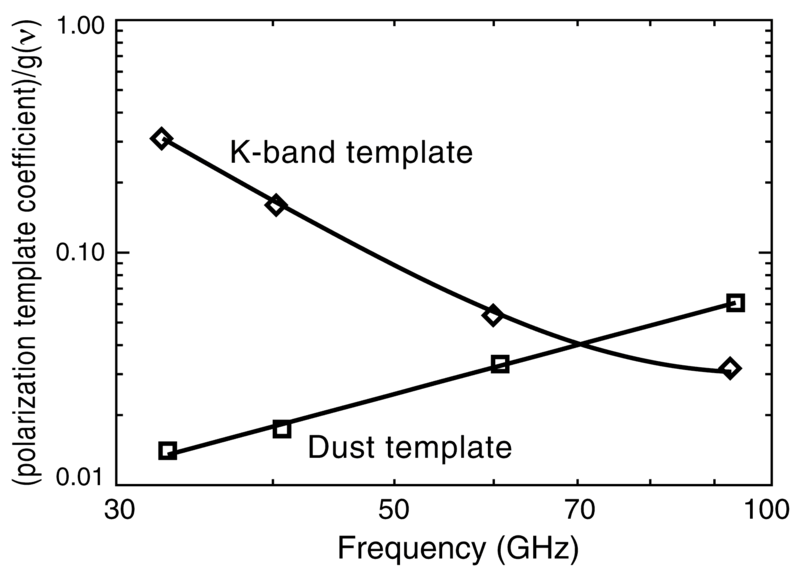 Construction of the K-band mask is more complex (see text) yet still achieves ξ < 8 μK. 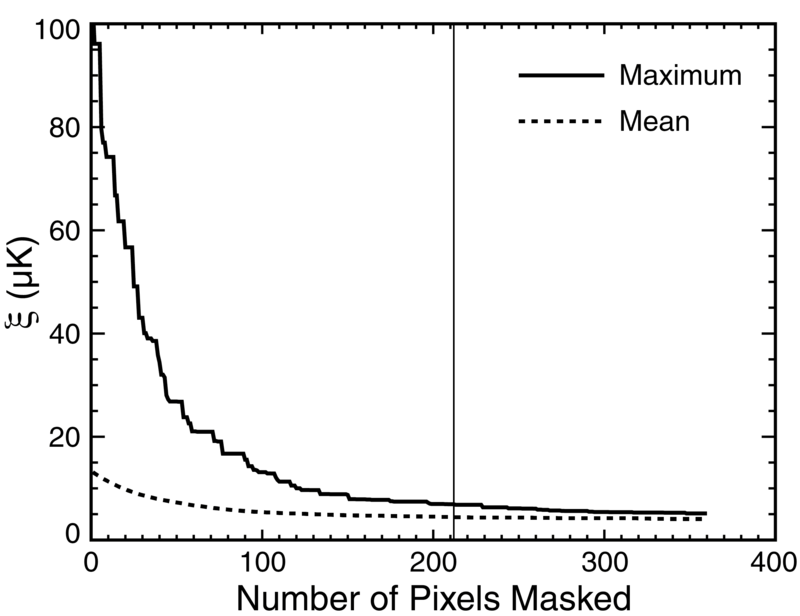 Plots of the maximum and mean magnitude of the estimated map artifacts (ξ) for Ka-band versus the number of pixels masked by the processing mask. The vertical line indicates the adopted mask which is the smallest mask for which max(ξ) < 1.15 ξmax sat as described in the text. 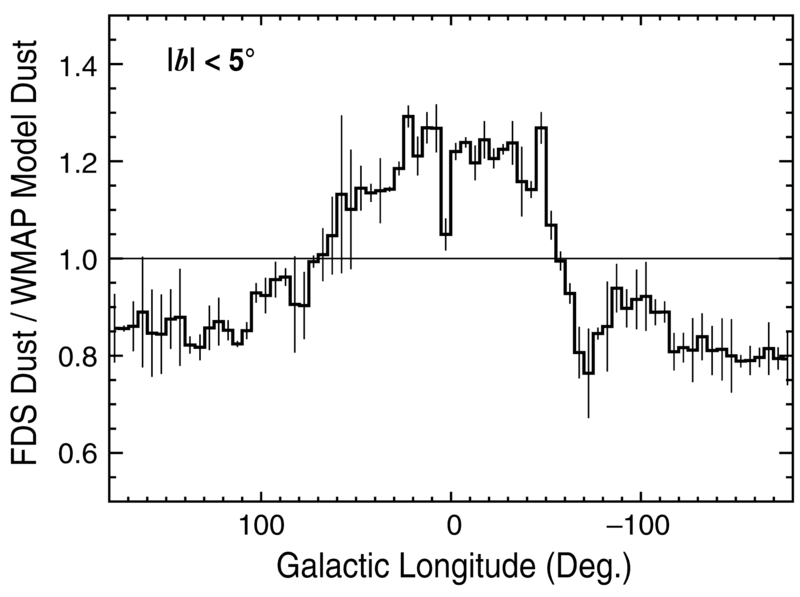 Nine-year temperature sky maps in Galactic coordinates shown in a Mollweide projection. Maps have been slightly smoothed with a 0.°2 Gaussian beam. 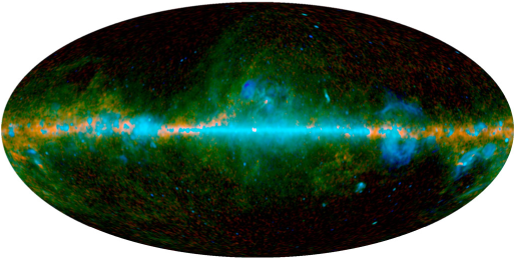 Nine-year Stokes Q polarization sky maps in Galactic coordinates shown in a Mollweide projection. 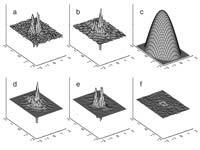 Maps have been smoothed to an effective Gaussian beam of 2.°0. The smooth large angular scale features visible in W-band, and to a lesser extent in V-band, are the result of a pair of modes that are poorly constrained in map-making, yet properly de-weighted in the analysis. Nine-year Stokes U polarization sky maps in Galactic coordinates shown in a Mollweide projection. Maps have been smoothed to an effective Gaussian beam of 2.°0. The smooth large angular scale features visible in W-band, and to a lesser extent in V-band, are the result of a pair of modes that are poorly constrained in map-making, yet properly de-weighted in the analysis. 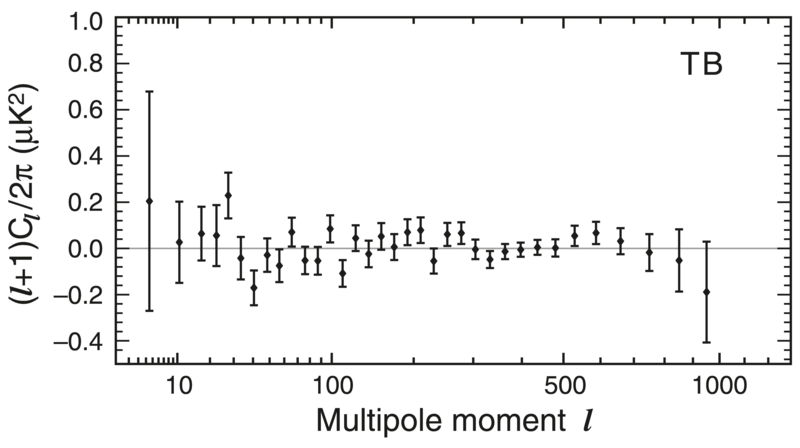 Nine-year polarized intensity (P) sky maps in Galactic coordinates shown in a Mollweide projection; P = (Q2 + U2)0.5, where Q and U are Stokes parameters. Maps have been smoothed to an effective Gaussian beam of 2.°0. Plotted line segments show polarization angles for HEALPix nside = 16 pixels where the signal-to-noise exceeds 1. 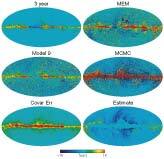 K-band images of supernova remnant Tau A (3C 144), at [J2000.0] position (05h34m31s, 22°01') from the first year of WMAP observations. The left panels display the total intensity and right the residuals after removal of a best fit circularly symmetric beam profile. 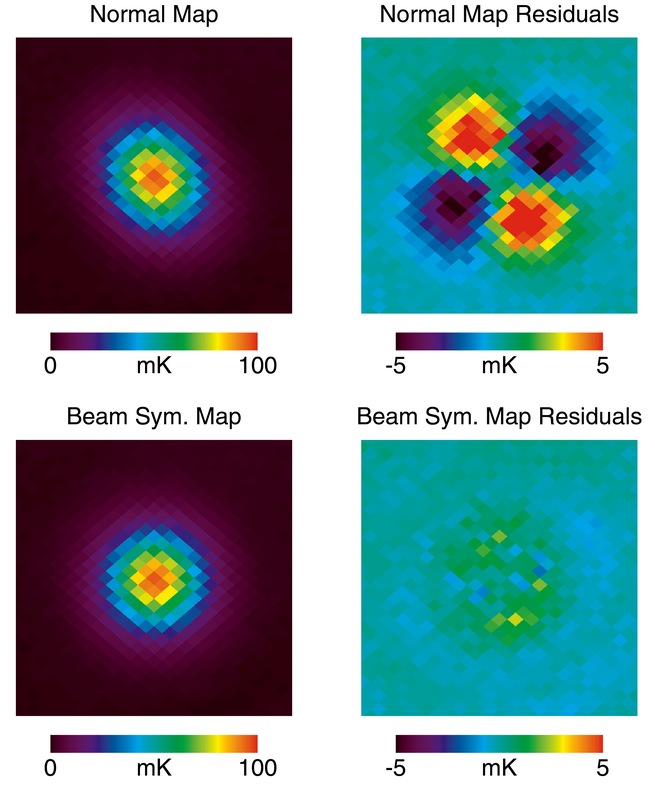 The maps generated with the new partial deconvolution processing (bottom) display significantly reduced beam asymmetry compared with those generated with the standard processing (top). In other words, the apparent asymmetry in Tau A seen in the top left is a result of the asymmetric K-band beam and is not intrinsic to Tau A. 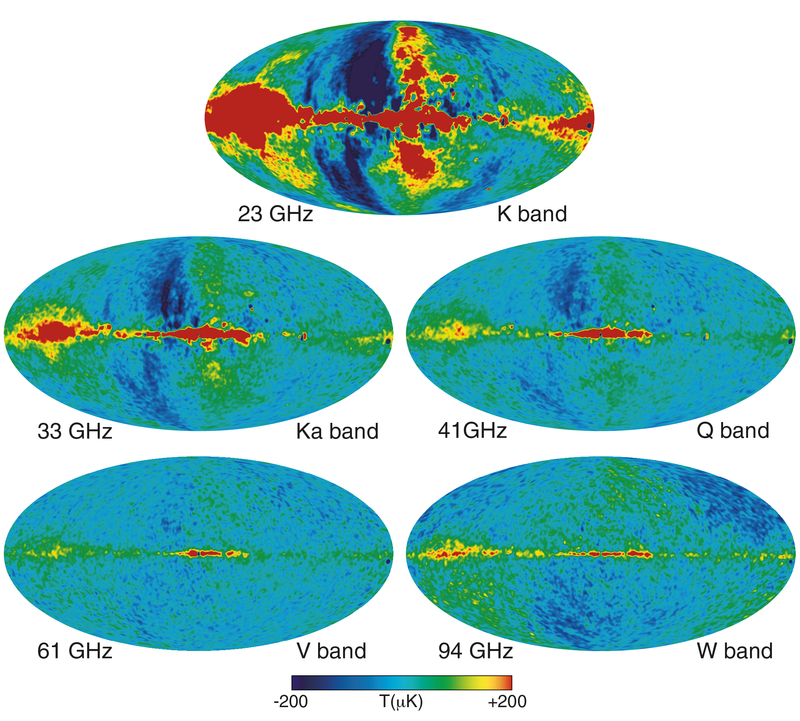 The degree of a source's apparent asymmetry is dependent on its sky position and the WMAP frequency at which it is observed: the effect is most pronounced for bright K-band sources at low ecliptic latitudes (Section 4.2). 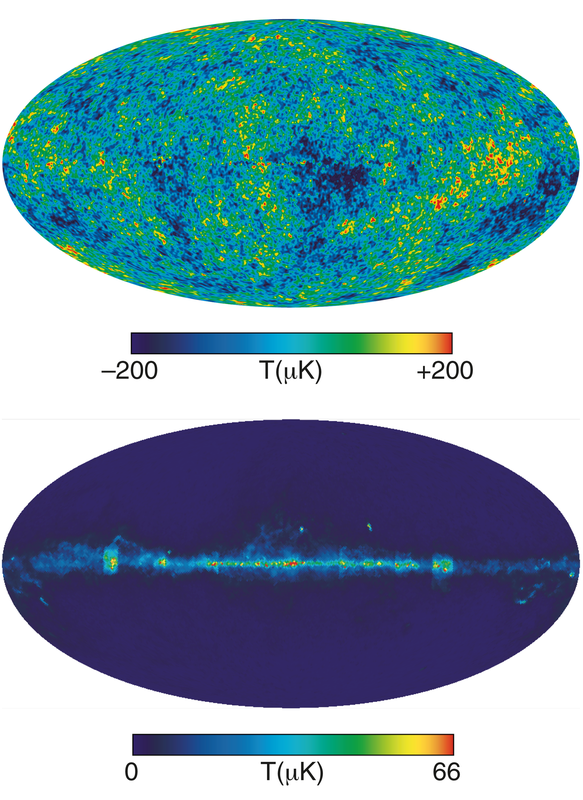 As such, we display the K-band observations of Tau A to demonstrate the effectiveness of the deconvolution in a worst case of beam asymmetry in the normally processed maps. 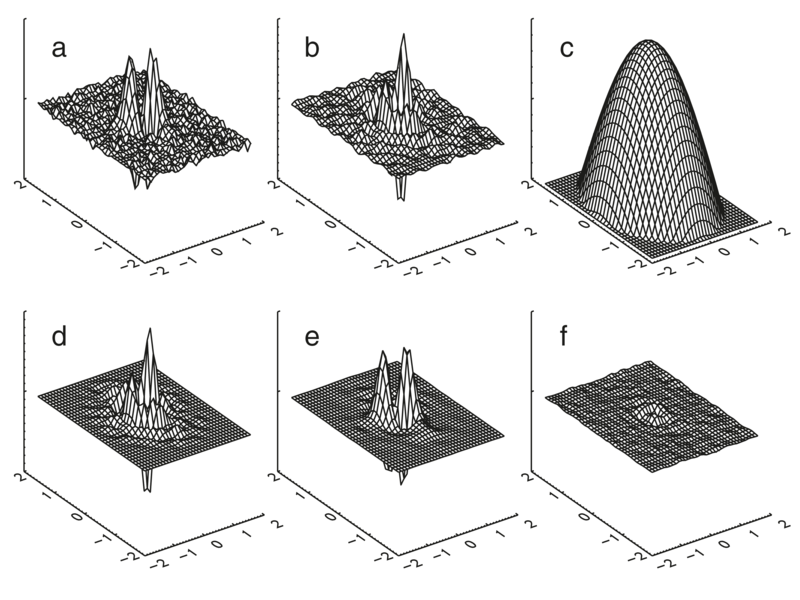 Plots illustrating the formation of the kernel used to generate the symmetrized beam maps for the Q1 DA. The x and y axes are in units of degrees centered on the beam LOS. The z-axis represents weight and panels (a), (e) and (f) use the same scale. (a) The residual (non-axisymmetric) component of the beam obtained by subtracting the best fit axisymmetric beam from the total beam map. (b) The residual beam after Wiener deconvolution. (c) The cosine apodization function. (d) The convolution kernel used to generate the symmetrized beam maps consisting of the cosine weighted Wiener deconvolved residual map. (e) The convolution kernel reconvolved with the axisymmetric beam. (f) The difference between the residual beam map (a) and the map making kernel convolved with the axisymmetric beam (e). Verification of effects of asymmetric beams on the power spectrum. 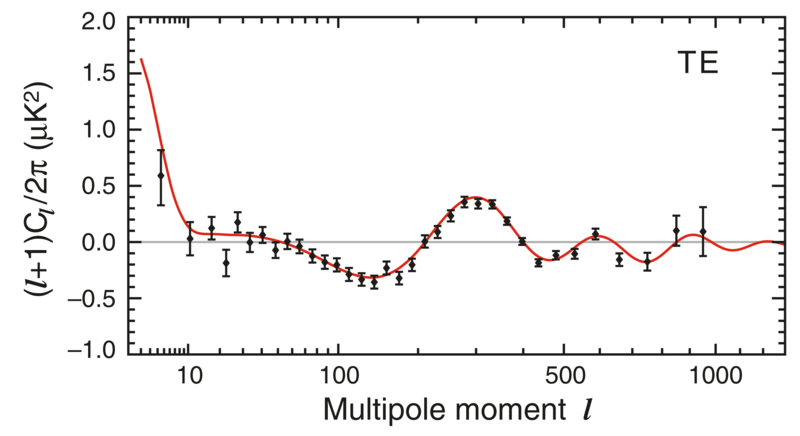 Given beam measurements, the formalism in Appendix B of Hinshaw et al. 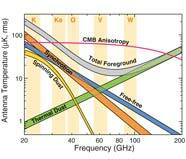 (2007) analytically quantifies the beam asymmetry effect on the power spectrum. This is plotted as a fractional deviation between an ideally deconvolved power spectrum (Cdeconvl ) and the power spectrum of a normally processed map (Cnpl ) with no correction for beam asymmetries. These "predictions" of fractional deviations are plotted per DA in the light colored solid lines. 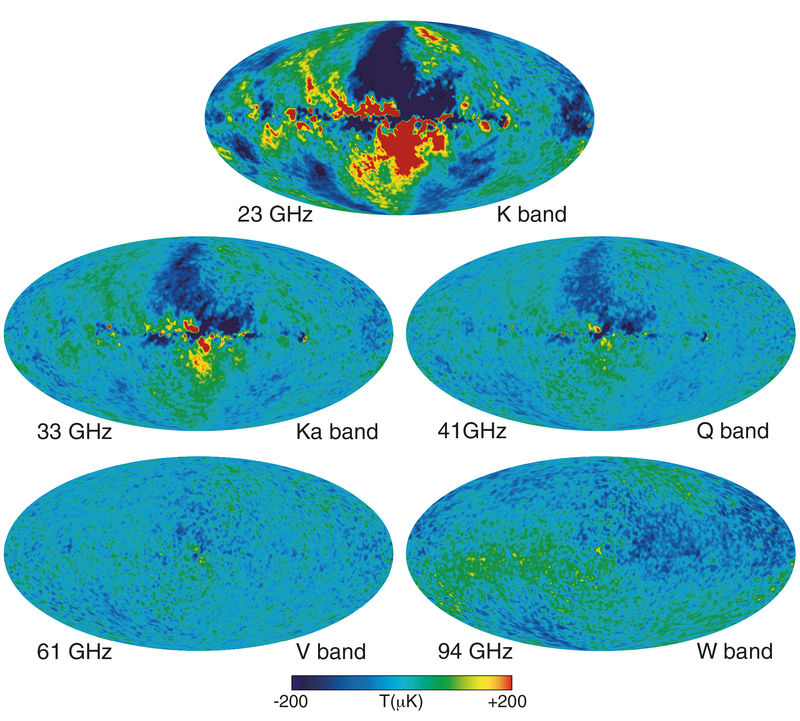 The Q-band effects become significant at l ~ 400, but Q-band is not used in the WMAP cosmological power spectrum. V-band effects become significant at l ~ 1000, however, V-band is deweighted compared to W-band at high l because of its larger beam size. W-band effects from the asymmetric beams can be seen to be . ≤1%. While Hinshaw et al. (2007) provides an analytic prediction, we have explicitly deconvolved the maps in pixel space, allowing for a direct intercomparison of the analytic with the numerical approach. The dark red, green and blue solid lines are the fractional deviations in power spectra for Q-, V- and W-bands from the directly deconvolved maps. A comparison between the light and dark colored lines per frequency band shows close agreement up to a multipole moment where we expect the spectra derived from the beam-symmetrized maps to break down because the prediction does not account for correlations introduced by the deconvolution. The Q-band deviations occur after the window function has dropped below 2.5% and the V-band deviations below 1.5%. The vertical dashed lines indicate where window functions are at 1% of their maximum value. The close agreement between the predictions and explicit deconvolution verifies our understanding of asymmetric beam effects and allows us to conclude that the spectrum from the normally processed (i.e. not deconvolved) maps differs from the ideally-deconvolved spectrum by < 1%. 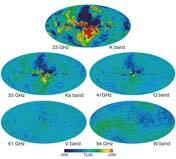 Thus the final WMAP power spectrum is based on the normally-processed V- and W- band maps. False color image representing the spectral information from multiple WMAP bands. 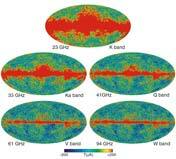 Q-band is red, V-band is green, and W-band is blue. 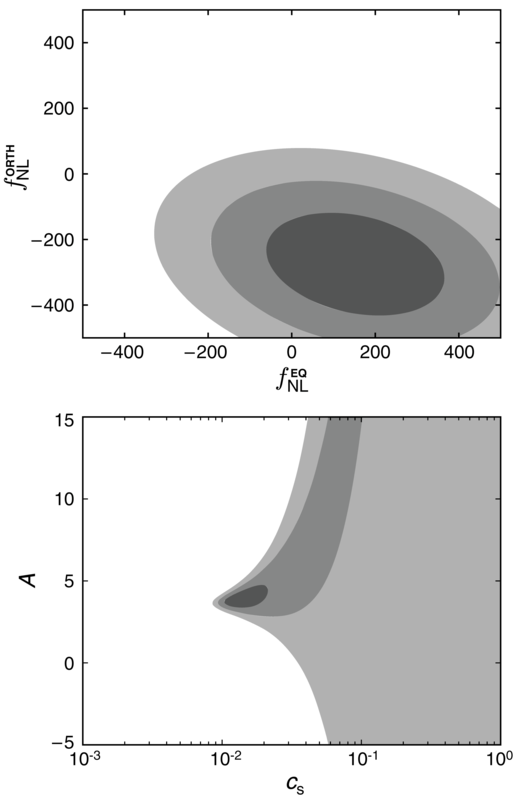 In this representation, a CMB thermodynamic spectrum appears as grey. False color image derived from a combination of WMAP band differences chosen to highlight differing spectral components. 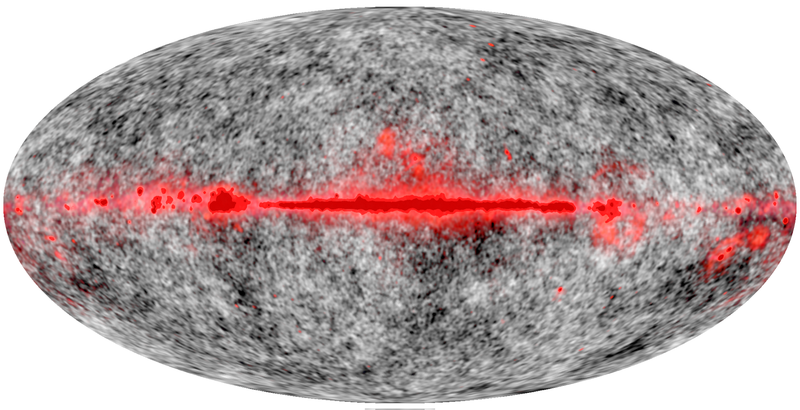 Red (W-V) highlights regions where thermal emission from dust is highest. Blue (Q-W) is dominated by free-free emission. 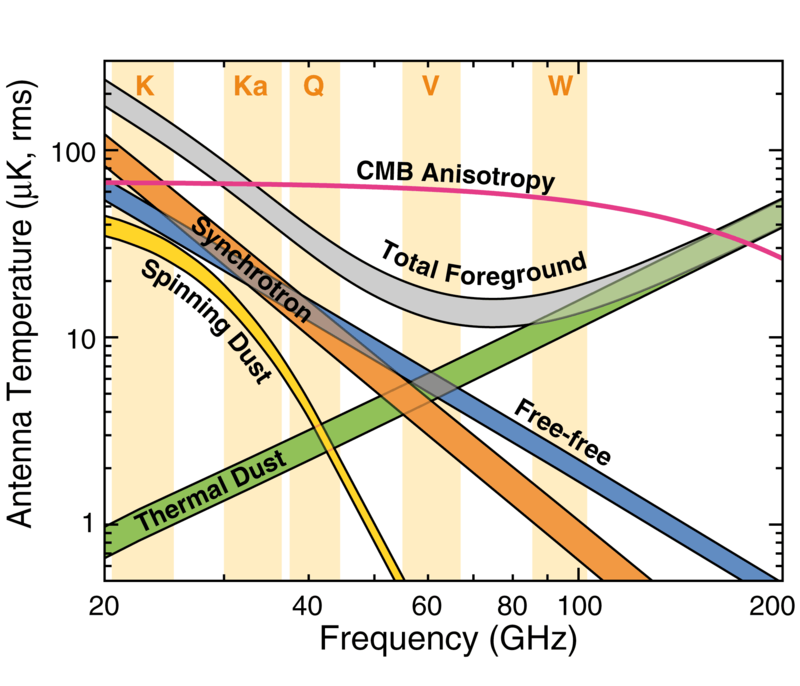 Green ((K-Ka)- 1.7(Q-W)) illustrates contributions from synchrotron and spinning dust. Microwave emission near the Galactic plane is traced by a K-band minus W-band difference map, which eliminates CMB anisotropy. A log scale is used for the color region and blue circles represent the positions of the brightest point sources, as seen by WMAP. Modeling results for Saturn. (Left) Brightness temperatures based on unresolved Saturn observations as a function of ring inclination B are shown in black for each WMAP frequency band. Where there are multiple differencing assemblies per frequency, multiple points are plotted at each inclination. An empirical model including both ring and disk components (see text) is plotted in red. The temperature of the planetary disk predicted by the model occurs at B=0°, when the rings are viewed edge-on. The model is symmetric about B=0°. (Right) Residuals (data-model) of the model fit to the data are plotted as a function of the ring opening angle. Saturn model parameters derived from the nine-year analysis. Left: Disk temperatures for 5 WMAP frequencies. 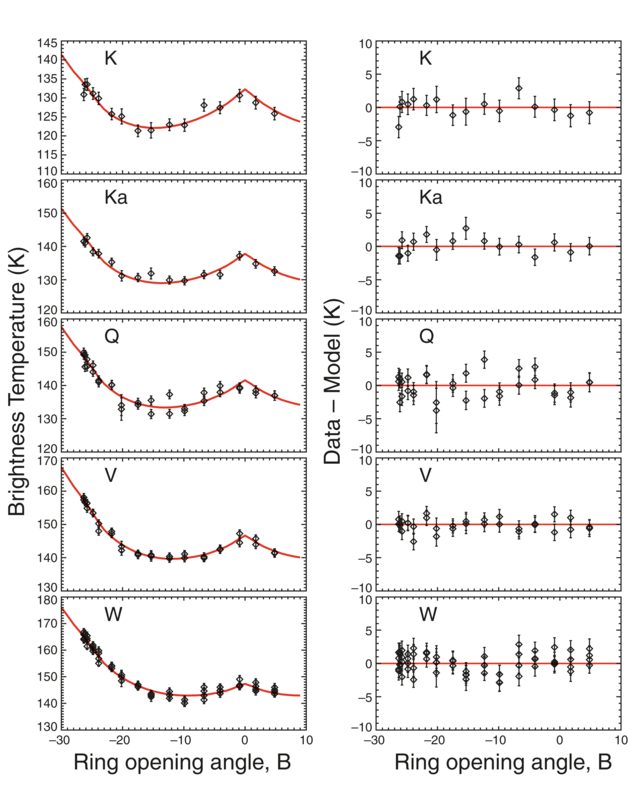 Right: Ring system temperatures. Adopted errors for the nine-year analysis have been reduced compared to those in Weiland et al. (2011); errors for Tdisk are smaller by a factor of 2. Foreground evaluation is generally based on a combination of the data from the five WMAP bands and external observations where the CMB contamination is negligible. The external observations used for foreground fitting and template removal are shown. 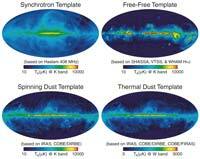 These provide approximate probes of the synchrotron, free-free, spinning dust, and thermal dust emission. 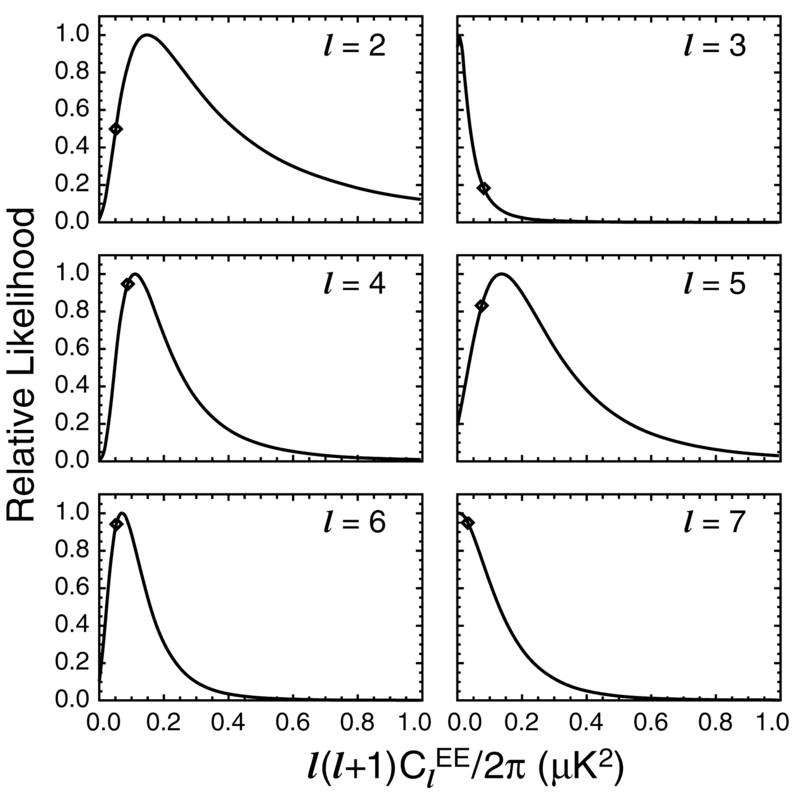 Polarization template coefficients, scaled to produce model maps in antenna temperature, as a function of frequency. 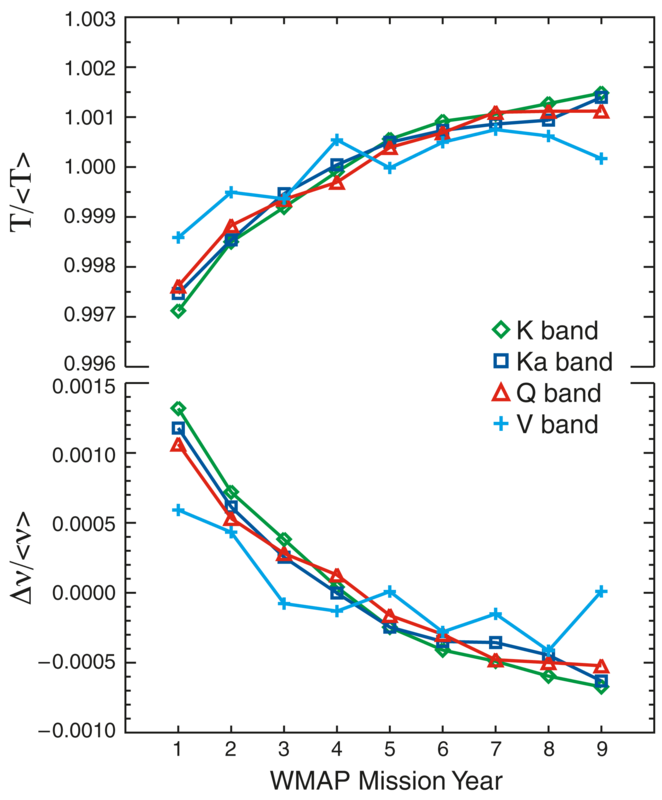 The curves show the predictions of a simple model with synchrotron and thermal dust polarization in which about 2/3 of the dust polarization is traced by the dust template and about 1/3 is traced by the K-band template. Comparison of nine-year masks to seven-year masks. At the top KQ75y7 and KQ75y9 are compared, and at the bottom KQ85y7 and KQ85y9. Green regions are masked in both the nine-year and seven-year masks, yellow regions are newly masked in the nine-year masks, and red regions are masked in the seven-year masks but no longer in the nine-year masks. The top panel shows spinning dust emissivity spectra predicted by the model of Ali-Haimoud et al. (2009) and Silsbee et al. (2011) for the nominal physical conditions that they adopted for different ISM environments - cold neutral medium (CNM), warm neutral medium (WNM), warm ionized medium (WIM), molecular cloud (MC), photodissociation region (PDR), reflection nebula (RN), and dark cloud (DC). The spectra were calculated using version 2.01 of the code SpDust provided by the authors, for the case where dust grains are allowed to rotate around non-principal axes. The spectra are in units of brightness temperature per H column density. The bottom panel shows the same spectra normalized to a peak of unity and scaled to a common peak frequency (that of the CNM spectrum, 17.8 GHz). The predicted spectral shapes for the different environments are similar. 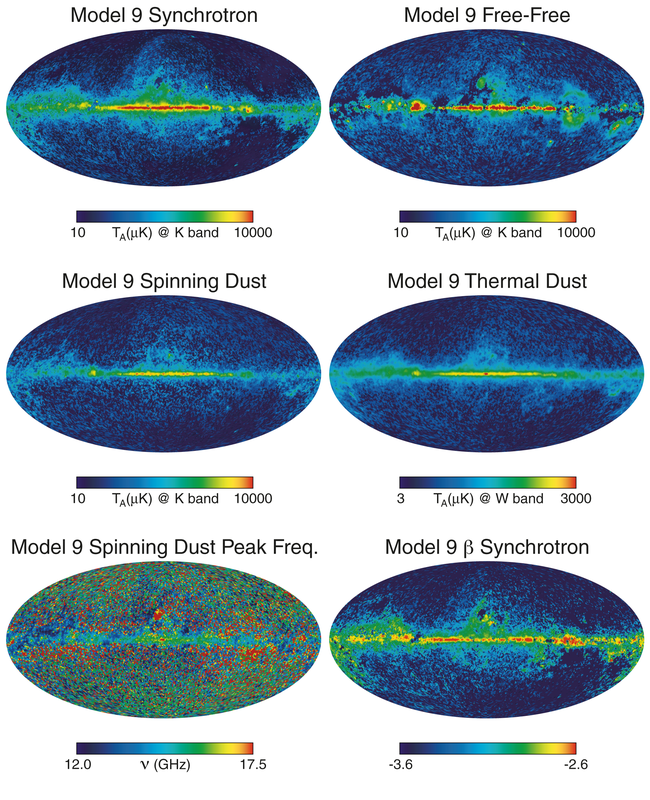 We adopted the CNM case for the shape of the spinning dust spectrum in our foreground fitting. We used this as an externally provided spectral template in our fits, usually with our own arbitrary amplitude and frequency scaling. The fit results in no way imply that the underlying physical mechanisms or the line-of-site conditions have been established. Parameter maps from the MEM model fit. The top four maps are shown on logarithmic scales and the others are on linear scales. Parameter maps from the MCMCg model fit. The top four maps are shown on logarithmic scales and the others are on linear scales. Accurate determination of the CMB close to the Galactic plane is inhibited by CMB-foreground covariance. The map for β synchrotron is evaluated at 40 GHz. Parameter maps from the Model 9 fit. The top four maps are shown on logarithmic scales and the others are on linear scales. The map for β synchrotron is evaluated at 40 GHz. Spectra of CMB and foreground anisotropy. The foreground anisotropy results are averages over the three foreground models (MCMCg, MEM, and Model 9). The upper curve for each foreground component shows results for pixels outside of the KQ85 mask, and the lower curve shows results outside of the KQ75 mask. 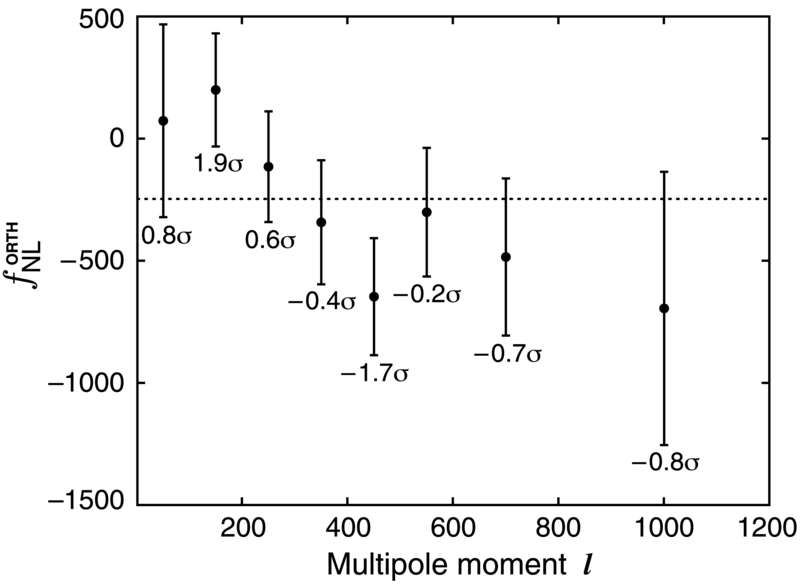 The different foreground models are in good agreement for the total foreground anisotropy. 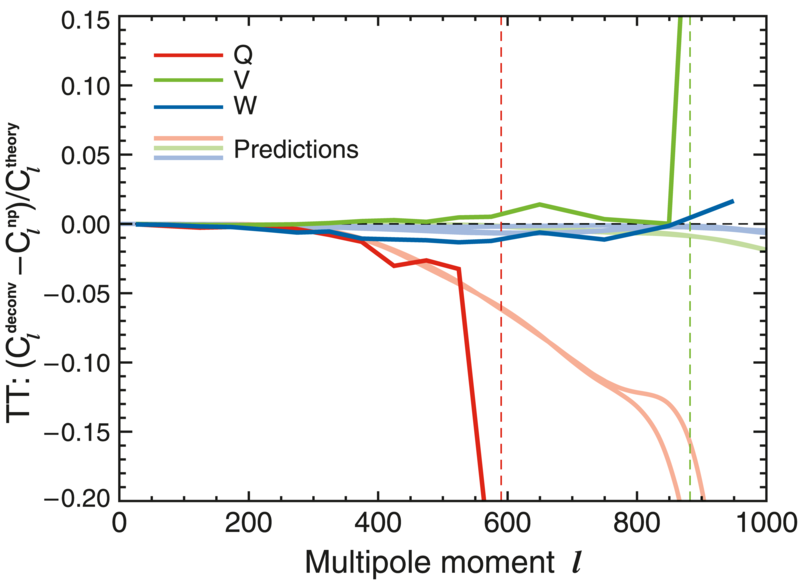 Results for the individual foreground components depend on model assumptions discussed in the text, and typically differ among the three models by 5% to 25%. Results from foreground degeneracy analysis for six-band Model 9 fitting. The contour plots illustrate the degeneracy between model parameters for a representative single pixel foreground spectrum. 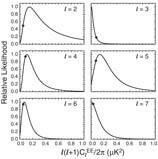 Each panel shows the change in Χ2 as the selected pair of parameters are varied from their best-fit values while marginalizing over the other parameters. Contours are shown for ΔΧ2 values of 0.2, 1, 3, and 10, except values of 0.5, 3, and 10 are used for βsync vs. synchrotron amplitude. 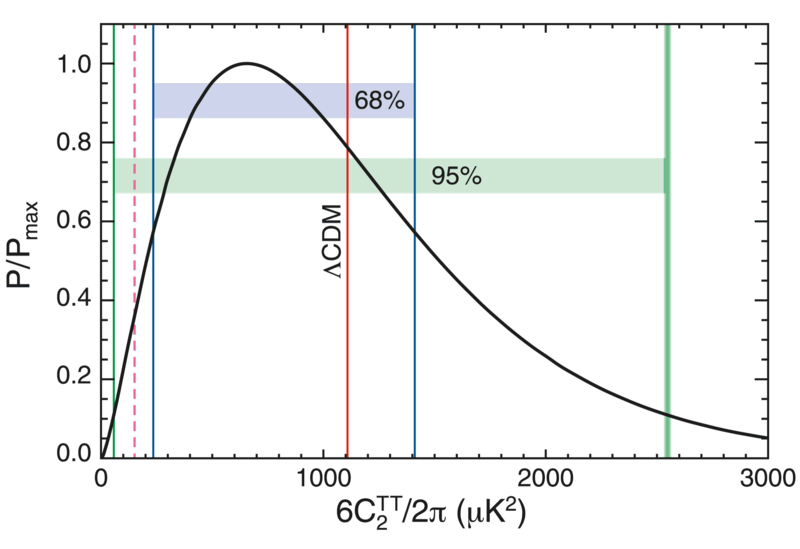 There are significant degeneracies between parameter pairs that include either synchrotron amplitude or synchrotron spectral index, except for those that include thermal dust amplitude. 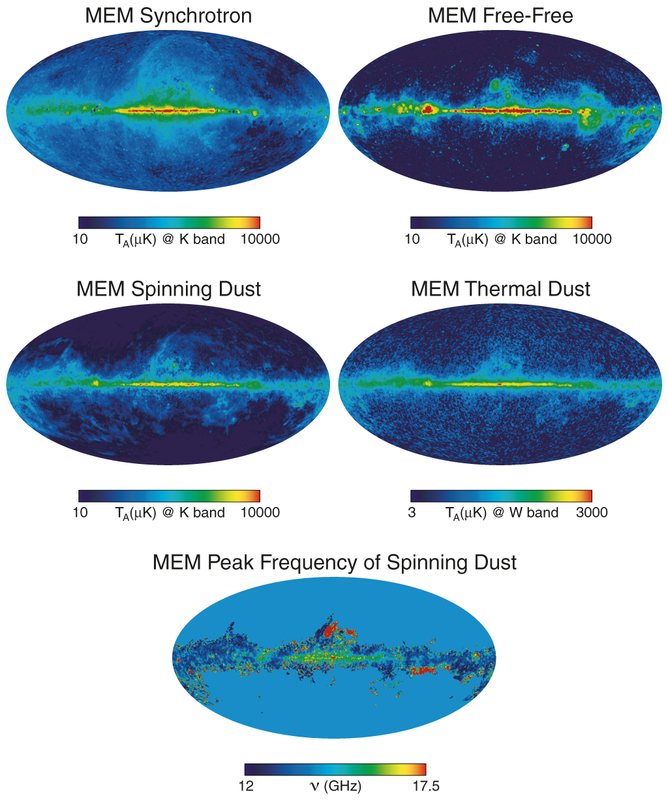 (Left): Thermal dust amplitude at W-band averaged over the MCMCg, MEM and Model 9 fits minus the thermal dust model 8 from Finkbeiner et al. (1999). (Right): Free-free amplitude at K-band averaged over the same three models, minus the free-free template estimated from Hα observations. 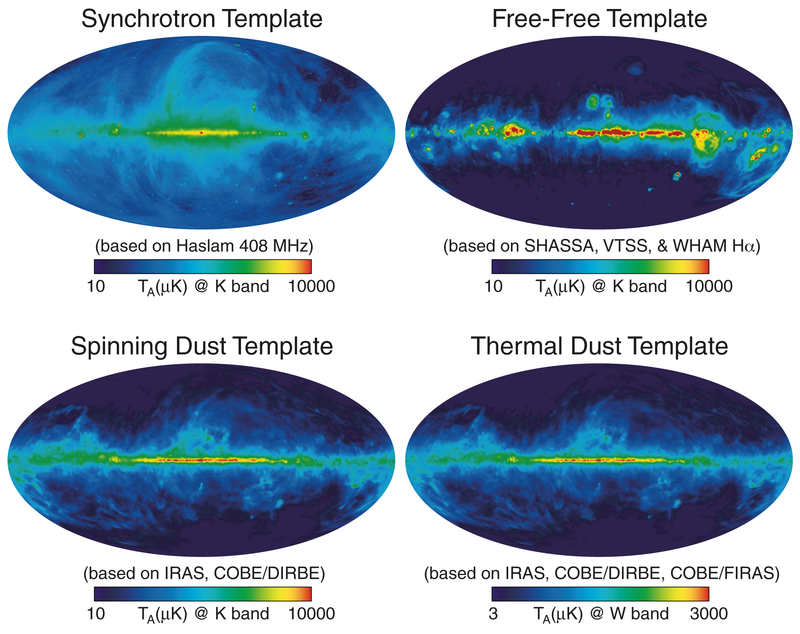 The ratio of W-band predicted thermal dust emission (Finkbeiner et al. (1999) model 8) to the mean over three models (MCMCg, MEM, Model 9) as a function of longitude for |b| < 5°. Error bars are derived from the rms scatter of the three models about the mean. A line is a plotted at 1.0 to guide the eye. 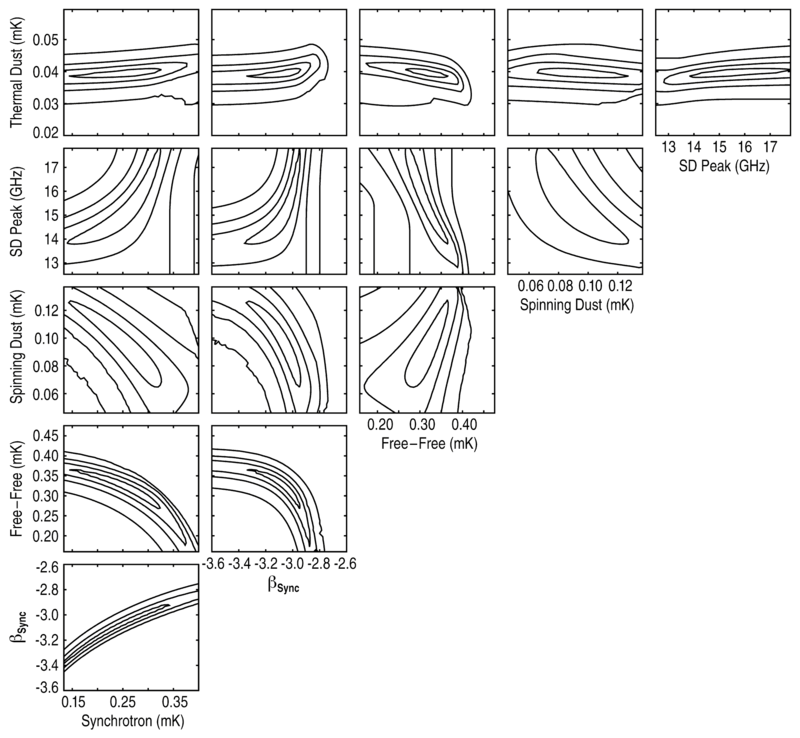 Modeled emission shows systematic variations from the FDS prediction by up to 20%. Estimates of foreground bias error remaining in the ILC map, on a scale of ±15 μK. Top left: Bias map from the three-year analysis of Hinshaw et al. (2007). The map is zeroed outside the Kp2 cut. 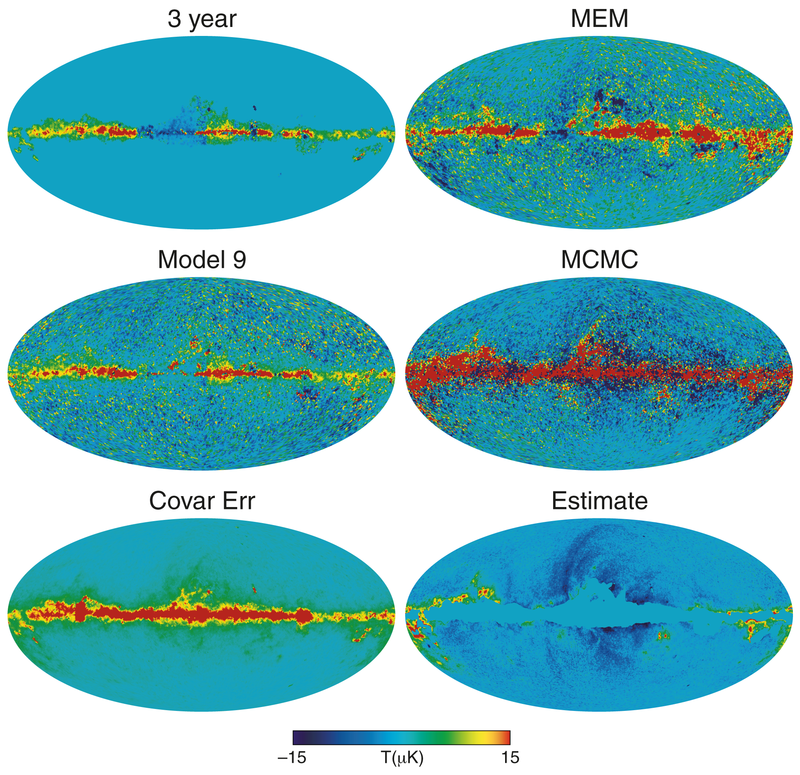 Top right and middle: Bias estimates resulting from the application of the nine-year ILC coefficients to the Galaxy models from MEM, Model 9 and MCMCg analysis. The bias map from the MCMCg analysis is overestimated in the plane (see text). 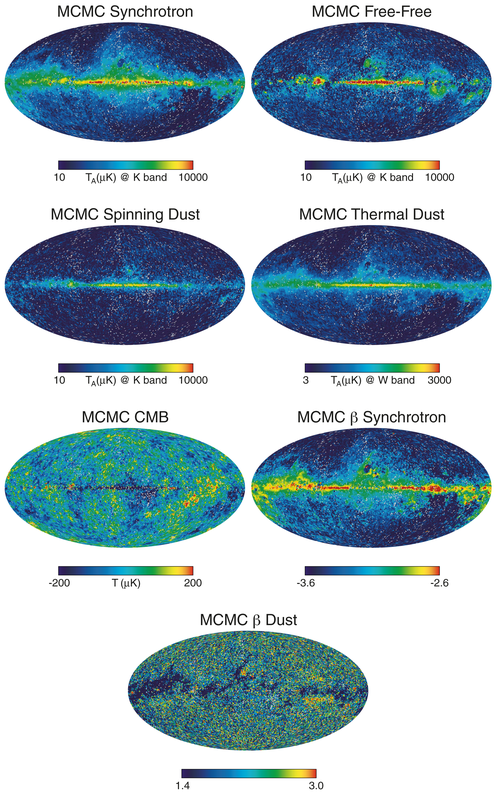 Bottom left: ILC error from foreground-CMB covariance. Within the Kp2 cut, this error and the foreground bias are of comparable magnitude. Bottom right: An estimate of the potential magnitude of ILC foreground bias outside the Kp2 cut, based on the various model results, with heavy weight given to the MCMCg model. Bias errors of 10μK or less are indicated. The top map is the nine-year ILC. 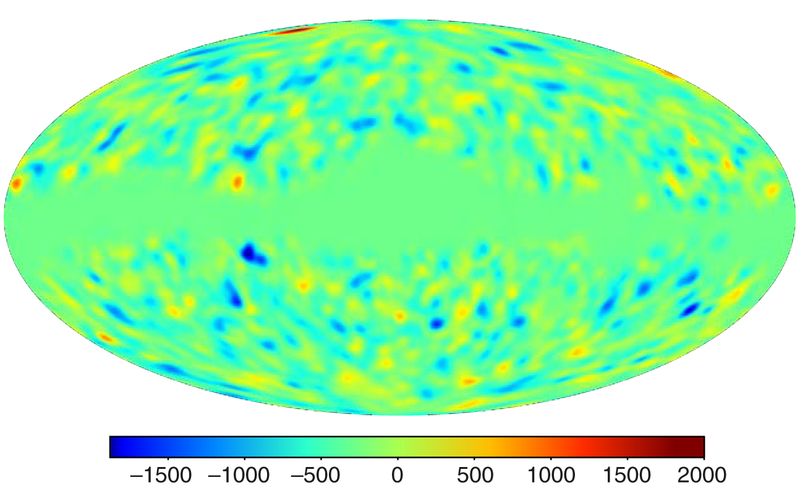 The bottom sky map displays the part of the ILC error in each pixel due to foreground-CMB covariance, using the Model 9 foreground estimate from Section 5.3.6. This shows the square root of the diagonal of the covariance matrix, on a linear color scale. Therefore it shows the standard deviation of expected error fluctuations, marginalizing over correlations between pixels. 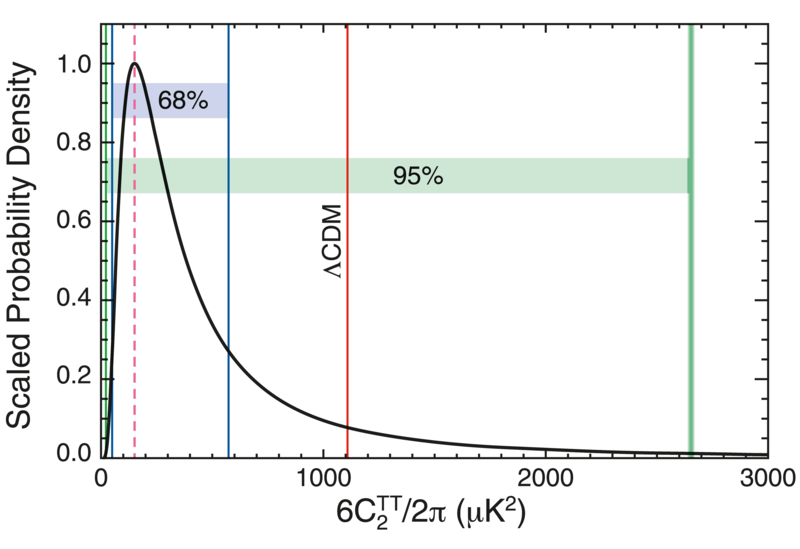 The color scale range was chosen because the r6 ILC map has a CMB standard deviation of 66 μK. Thus, full scale on this map has equal variance with the CMB, and at the halfway point on this color scale the foreground-CMB error variance is down to a quarter of the CMB variance.
. The saturation describes how well the data fit a power law, so that desaturated (white, gray, black) pixels are not well fit by any power law. Specifically, let nA be a 5-vector of the WMAP thermodynamic temperatures, rescaled to be a unit vector, and let np be a 5-vector of the best fit power law in antenna temperature, converted to thermodynamic and then also rescaled to be a unit vector. Then the saturation is nA · np, which is just the cosine of the angle between these two vectors. The scale is from 0.995 (unsaturated) to 1.0 (completely saturated), so if the two 5-vectors are more than 5.73 degrees apart, the pixel is unsaturated. The value in the HSV color space is the magnitude of the data 5-vector, so it is the square root of the sum of the squares of the WMAP thermodynamic temperatures, on a scale of 0 to 2 mK. Therefore blacker pixels have less emission in all bands; lighter pixels have more emission. 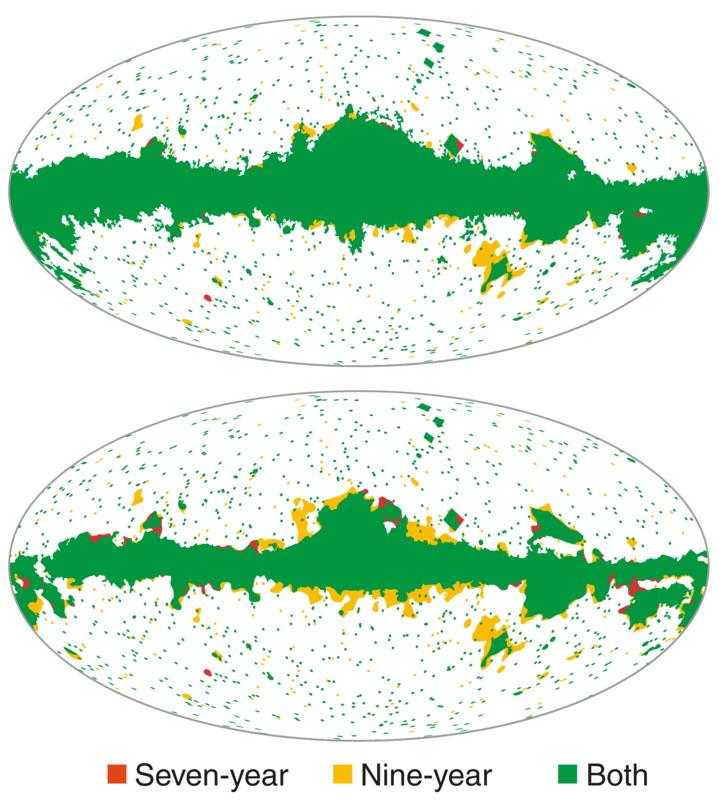 The nine-year ILC was subtracted from the WMAP data, before computing the above image. End-to-end Monte Carlo pipeline tests. The gray lines are individual l's and the black lines are boxcar smoothed with Δl = 50. 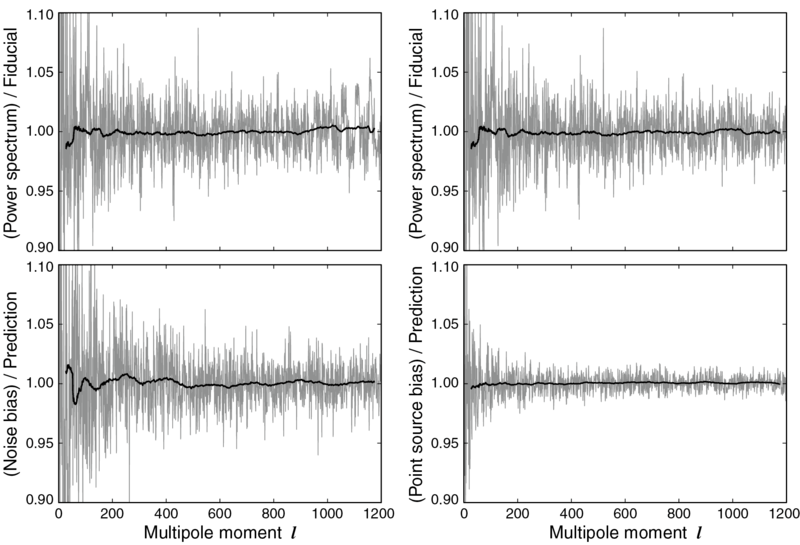 In all four cases, the ratio of the Monte Carlo estimated power spectrum and the predicted value is consistent with unity. Top left. 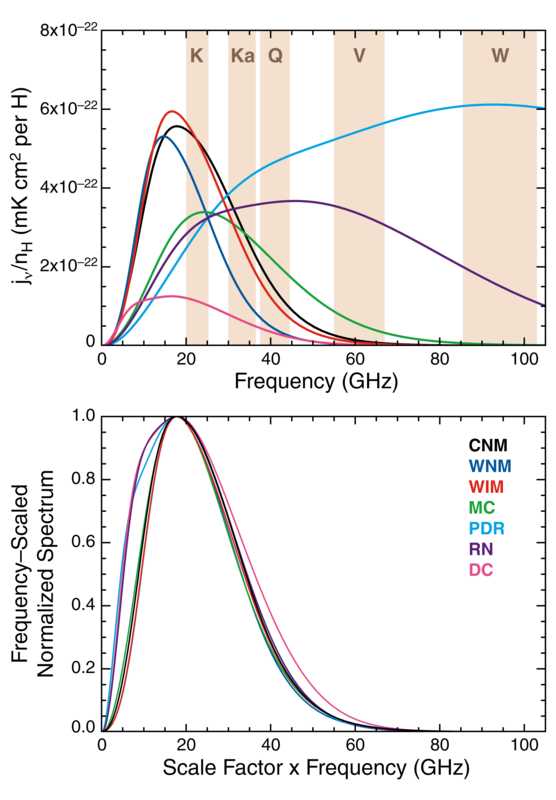 Ratio 〈Ĉ×l〉sig/Cfidl between mean estimated power spectrum of CMB-only simulations and the fiducial input spectrum. Top right. Same as top left panel, but using the autocorrelation estimator Ĉl instead of the no-auto estimator Ĉ×l . Bottom left. Ratio between mean estimated power spectrum of noise-only simulations and the predicted noise bias, using the auto-estimator Ĉl. Bottom right. 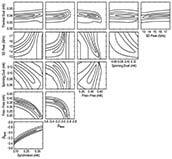 Ratio between mean estimated power spectrum of point source simulations and predicted bias. Binned WMAP7 power spectrum estimates using the optimal pipeline from this paper (left/black error bars), with the estimates from the WMAP7 release (Larson et al. 2011) shown for comparison (right/grey error bars). Detailed comparison between WMAP7 optimal power spectrum estimator and suboptimal estimator from Larson et al. (2011). Top: Difference (Ĉoptimal l - Ĉsubopt l)/Var(Ĉoptimall)1/2 between the two estimators in "sigmas", for every l, and boxcarsmoothed with Δl = 10. Bottom: Variance ratio between suboptimal and optimal estimators. The nine-year WMAP TT angular power spectrum. 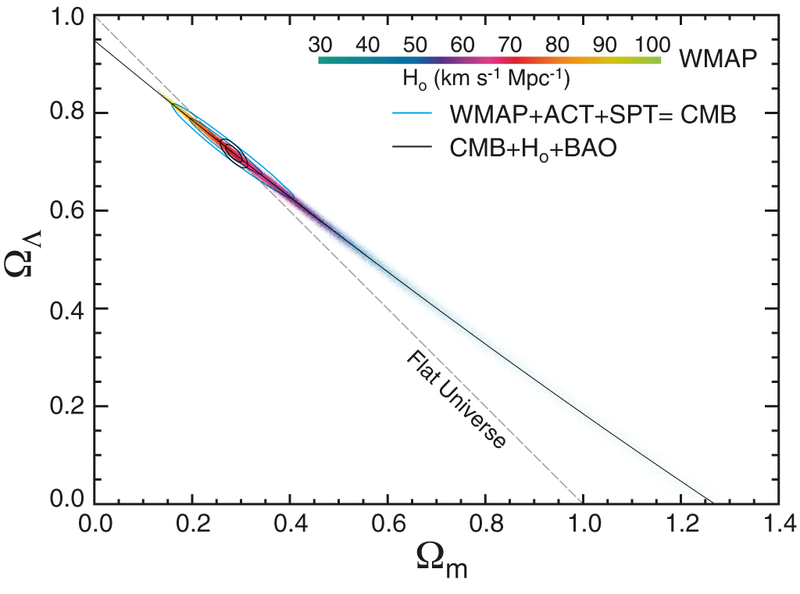 The WMAP data are in black, with error bars, the best fit model is the red curve, and the smoothed binned cosmic variance curve is the shaded region. The first three acoustic peaks are well-determined. The TE spectrum. The WMAP data points and error bars are in black. The red theory curve is fit to the full WMAP data, including the TT angular power spectrum data. Note that the vertical axis on these spectra is (l + 1)Cl/(2π) instead of l(l + 1)Cl/(2π); this vertical scale differs from that of the TT spectrum plot by a factor of l. The lowest l TE bin where 2 ≤ l ≤ 7 has been adjusted using a pixel likelihood code. The TB spectrum. The TB spectrum uses the MASTER likelihood code. Note that the vertical axis on these spectra is (l+1)Cl/(2π) instead of l(l+1)Cl/(2π); this vertical scale differs from that of the TT spectrum plot by a factor of l.
Individual likelihood functions of the low l EE polarized power are shown for l = 2 through 7. When fitting at a particular l, we set Cl at all other values of l to the value in the best fit WMAP power spectrum. In addition, at the l in question we set CTE l = 0 to maintain that CTEl ≤ √CTTl CEE l . The black diamonds denote the best fit WMAP EE power spectrum. 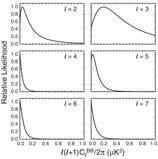 These likelihood functions include sample variance. Low l BB spectra. Other Cl values are fixed to the best fit WMAP power spectrum. Top: Even excess εl in the observed power spectrum, in bins of Δl = 50, compared to the mean and scatter from 512 Monte Carlo realizations. 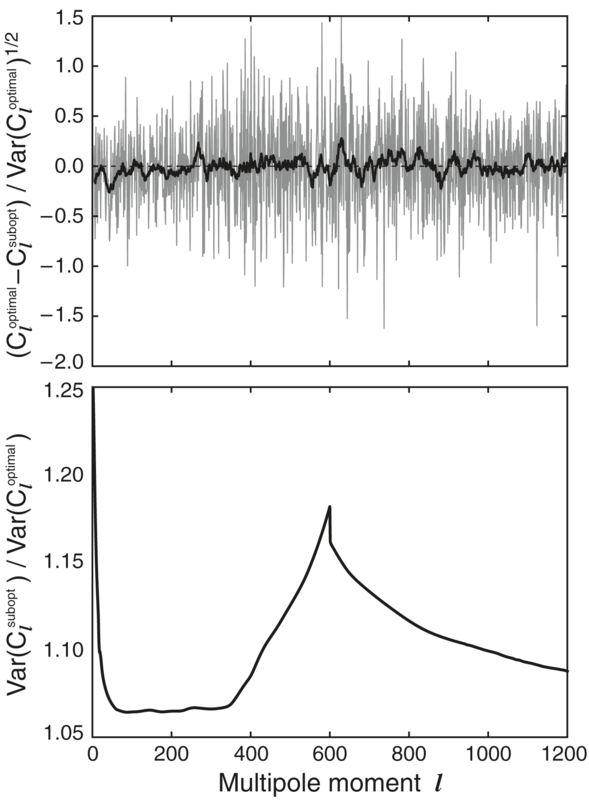 Bottom: εl as in the top plot, converted to significance units by normalizing to the Monte Carlo scatter in each bin. Only the l = 250-299 and l = 300-349 bins show a significance greater than 1σ. Black: nine-year results; blue: seven-year results from Bennett et al. (2011). The likelihood of the true value of l(l + 1)CTT l /(2π) = 6CTT 2 /(2π) for l = 2, based on our measured sky. This is computed using the Blackwell-Rao estimator run on Gibbs samples, and it marginalizes over all other values of CTT l . The maximum likelihood point is shown as the pink line; one and two sigma regions are shown as blue and green lines. The best fit CDM theory spectrum computed on WMAP nine-year data only is shown in red. 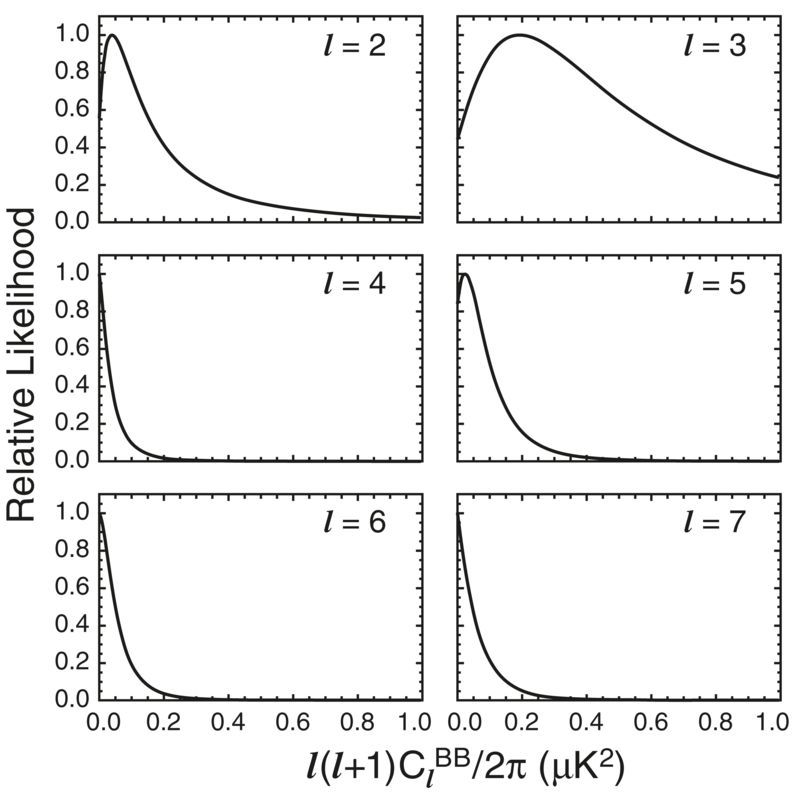 The cosmic variance probability distribution for the quadrupole, given the theory power spectrum. 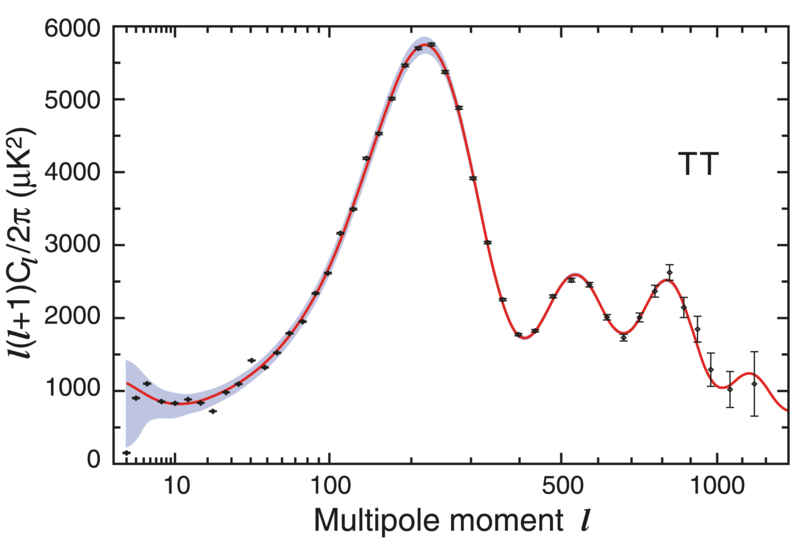 This assumes we know l(l + 1)CTT l /(2π) = 6CTT 2 /(2π) = 1109 μK2 (red line) and plots the distribution of quadrupole power values we could measure for random Hubble volumes. Note that 6CTT 2 /(2π) is the mean of the distribution; due to the skewness of the χ2 distribution, the peak of the distribution is substantially lower. One and two-sigma regions are shown. The quadrupole cosmic variance distribution has ν = 2l + 1 = 5 degrees of freedom. Assuming fsky ≈ 0.99, we plot a χ2 distribution based on ν = (2l + 1)f2 sky ≈ 4.9 degrees of freedom. The peak of the distribution is then lower than the mean by a factor of (ν - 2)/ν, putting it at 656 μK2. A test for scale-dependent systematics: forthNL estimates in l-bands, with cumulative best-fit value forth NL = -245 shown by the dotted horizontal line. Each error bar is labeled with the statistical significance of the deviation from the cumulative best-fit value (not the deviation from zero). No evidence for scale-dependent systematics is seen. A visual test for sky location dependent systematics: skymap showing the contribution of different parts of the sky to the forthNL estimator, in units of "forthNL per steradian". We do not detect any significant localized features in this map. 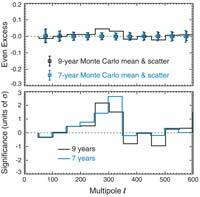 WMAP nine-year constraints on non-Gaussianity in single-field inflation. Upper panel. 68%, 95%, and 99.7% confidence regions in the feqNL, forthNL plane, defined by threshold χ2 values 2.28, 5.99, 11.62, as appropriate for a χ2 random variable with two degrees of freedom. (feqNL, forthNL ) = (0, 0) is consistent with the data to within 99% CL. Lower panel. Confidence regions on the dimensionless sound speed cs and interaction coefficient A (defined in Equation (56)), obtained from the top panel via the change of variables in Equation (57). The upper bound on feqNL gives a lower bound on cs, which is consistent with cs = 1. Constraints on curvature. Flat universes fall on the Ωm + ΩΛ = 1 line. Allowed regions are shown for WMAP, CMB, and CMB combined with BAO and H0 data, all with a hard prior of H0 < 100 kms-1Mpc-1. WMAP data is represented by 290,000 Markov chain points, colored by their value of H0. The WMAP data follow a geometric degeneracy ridge represented by the slightly curved line, a parabola with equation ΩΛ= 0.0620Ω2m - 0.825Ωm + 0.947. The most likely point in the WMAP-only chain has ΩΛ = 0.721 and Ωm = 0.279, which is flat to three significant figures, even though this constraint was not enforced. The WMAP data alone require ΩΛ > 0.58 at 68% CL and ΩΛ > 0.22 at 95% CL. 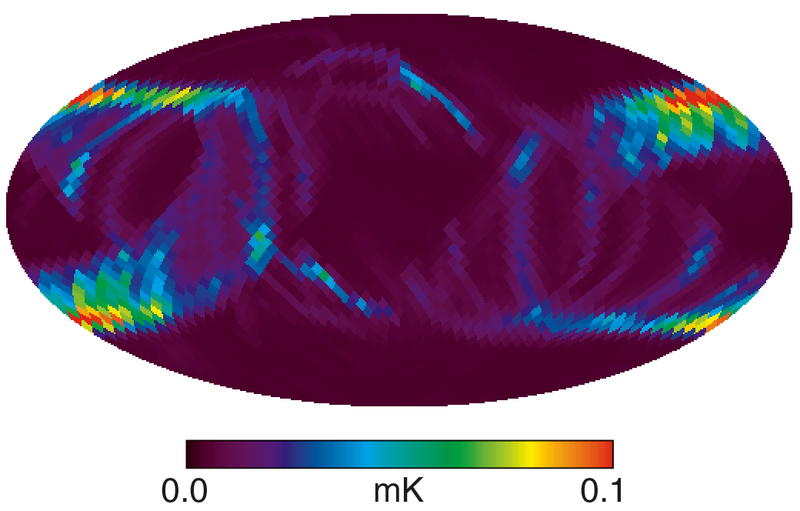 The contours show constraints when adding high-l CMB data (blue) and BAO and H0 data (black). These constraints are consistent with those from WMAP alone, with the tightest constraint being Ωtot = 1.0027+0.0038-0.0039 (Hinshaw et al. 2012). 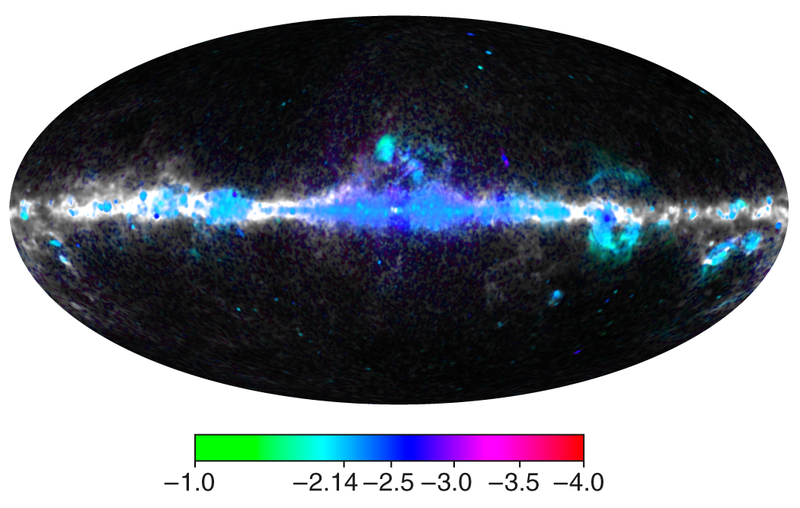 Top - Measurements of the year-to-year fractional brightness variation of the Galactic plane in WMAP skymaps, obtained by correlating Galactic plane signal in each single year map with Galactic plane signal in the nine-year map. 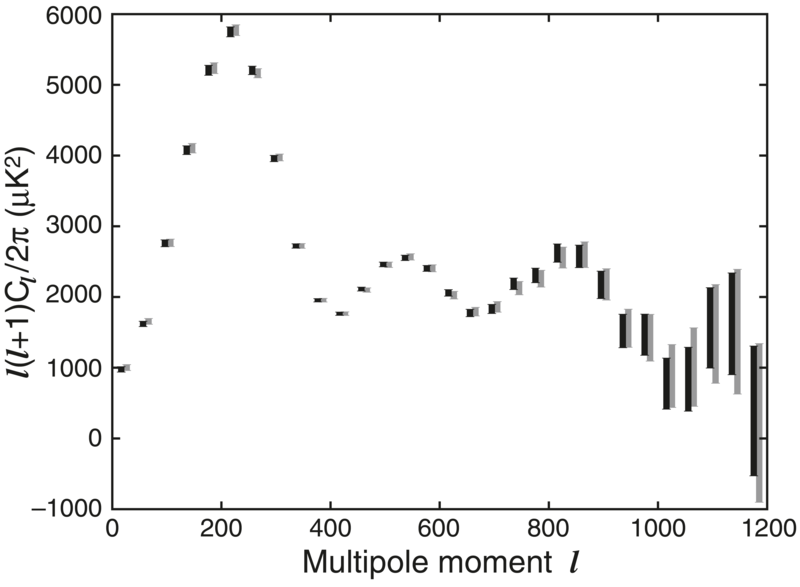 There is a small dependence of these variations on spectral index, which shows that they are caused by variations in effective WMAP band center frequencies over the mission. 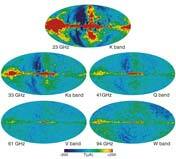 Bottom - The year-to-year fractional variation of WMAP band center frequency derived from Galactic plane brightness variations measured for selected spectral index bins.